Luxury homes and river views are certainly selling points at Potomac Shores, a transit-oriented, town center style development in Dumfries. But it is the community’s 13,000 square-foot recreational complex that is making headlines. Most recently, the project was featured in Builder magazine and “Heavy Timber Structures: Creating Comfort in Public Spaces,” a book highlighting projects where elements such as exposed beams are prominently featured to great effect. Outdoor features include nature trails, yoga garden, golf course, competition pool, a recreational pool and a greenhouse. 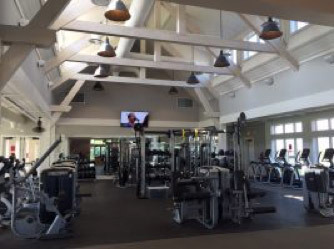 In the center of it all, a Social Barn and Fitness Barn offer residents a wealth of additional amenities. Developer SunCal brought in Olde Red General Contracting to oversee the project, which sought to connect residents to the beauty of their riverfront community, while also providing inviting indoor gathering spaces and activities. As part of its “Gathering Spots” story, Builder dedicated a two-page spread to the Shores Club, lauding its design and creation of a community hub, a popular development trend. “Heavy Timbers” noted that the barns, Market Pavilion and Pool Pavilion all contain heavy timber construction, creating a sense of warmth and adding to the indoor/outdoor flow of the buildings. Social Barn features include a demonstration kitchen, fireplace and cozy gathering spots with a 1,000 square foot community space that can be used for events or relaxing with neighbors. When residents are feeling more active, they can head to the Fitness Barn for a movement studio, gym, spin bikes and locker rooms.